There is quite the hubbub around booth SP20 at Art New York and its sister exhibition Context New York. It is the start of New York Art Week, with the glamorous Frieze at its center: severe haircuts and inventive tunics for the gallerists, tanned, wealthy buyers hovering, two observing a wooden installation of a battery farm with videos of chickens playing in each compartment… and there’s a Hollywood movie star selling his work at booth SP20. 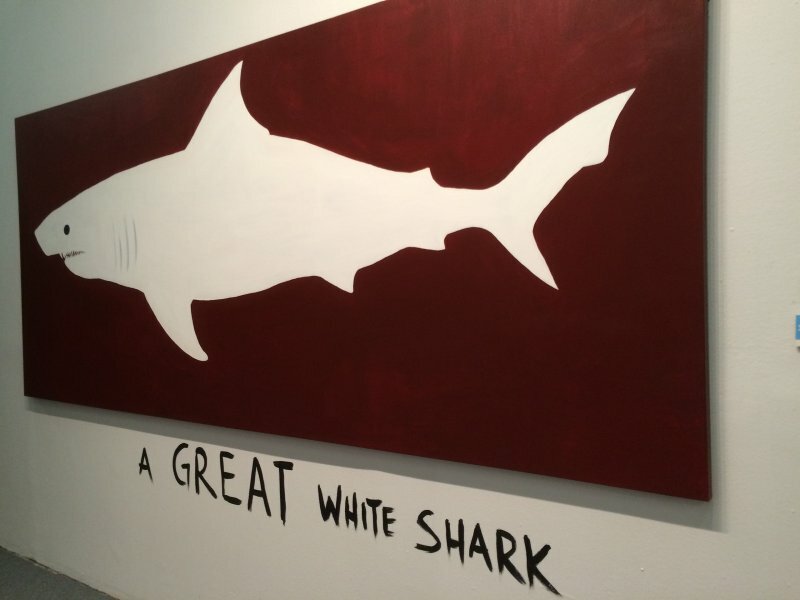 “I’m just going to see Adrien Brody,” one gallerist whispers dramatically to a colleague. 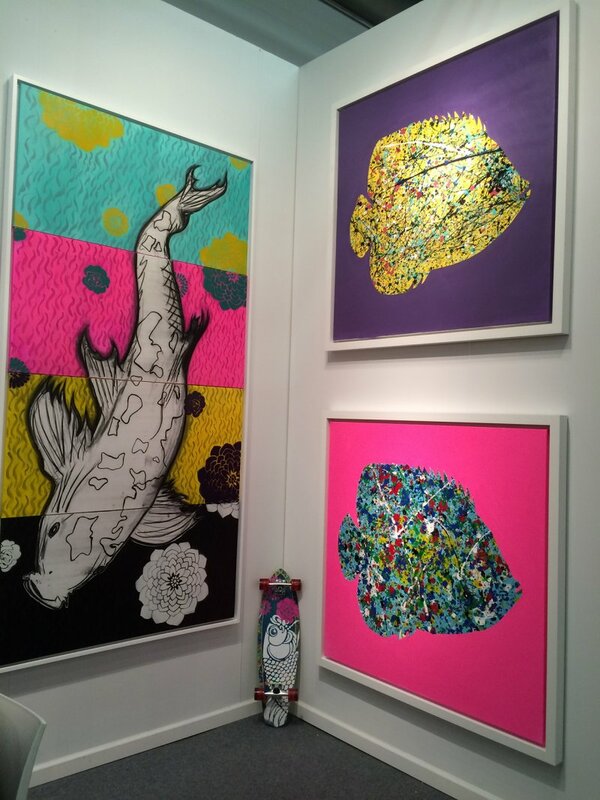 And off she darts to see the handsome 43-year-old Oscar-winning actor, whose collection of paintings of brightly colored fish, “Hooked,” has already attracted a mix of gawkers and admirers to this VIP preview. There may be 150 galleries representing nearly 1,200 artists from 50 countries here, but really the buzz is only about the Hollywood star of The Pianist, for which he won the Best Actor Oscar in 2002—the youngest actor to do so—at age 29. Brody’s other films have included Midnight in Paris and The Grand Budapest Hotel. Brody will soon appear in Manhattan Night, playing Porter Wren, a crime reporter and columnist whose portrayal was influenced—in the novel it is based on, Manhattan Nocturne—by The Daily Beast’s Michael Daly. Brody himself, bearded, hair pulled back, has paint all over his hands and is wearing a white robe with his initials on it. He looks like both an artist and a doctor, and, wielding a paintbrush, slightly comic—perhaps even from a Paul Thomas Anderson movie. “I was actually going to write ‘Happy Ending’ on the back of this robe because it looks like what a massage therapist would wear,” he says, smiling. On the table in front of him is a plastic container of paint, some prepackaged fruit salad, a half-eaten croissant, and a bowl of candy—his usual sustenance when he paints (at home this may include beer, too). The tropical fish are multicolored, and on block-colored backgrounds. “I love fish. I think they’re beautiful in a physical form, remarkable creatures,” Brody says. 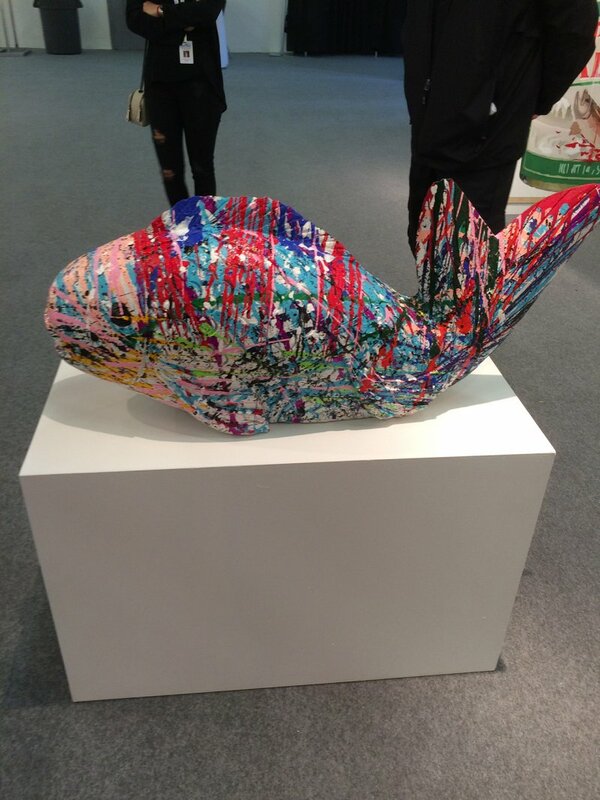 The concept for the images came to him in a dream, and he hopes the many paint drops that make up the pictures of the colorful fish against a solid background “exude” individuality, “like the DNA in living creatures. I also love the chaos of our inner molecular structures, our indefinable beings and this opaque, very clean backdrop. Another piece features a mermaid, guns trained on her head. 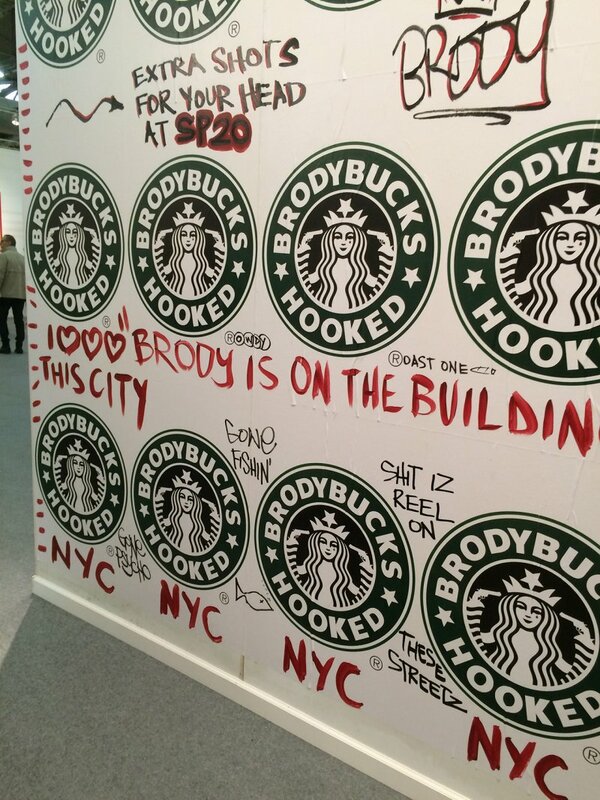 This is informed, as is Brody’s Starbucks satire, by his “despair” about consumerism, he says. “We toss paper cups into the waterways. We all have a part in destroying our environment, we are hooked on the convenience of throwing things away.” He castigates himself for using the two cups on the table and not getting a Thermos. He has painted and drawn since he was a young boy, “completely immersed in the art world in New York City.” Brody’s mother, Sylvia Plachy, photographed celebrities for the Village Voice—“Warhol, Timothy Leary, you name it,” Brody says proudly. As a child, Brody drew fish, dragons, and dinosaurs, but didn’t pursue painting in his “very busy years” as an actor. 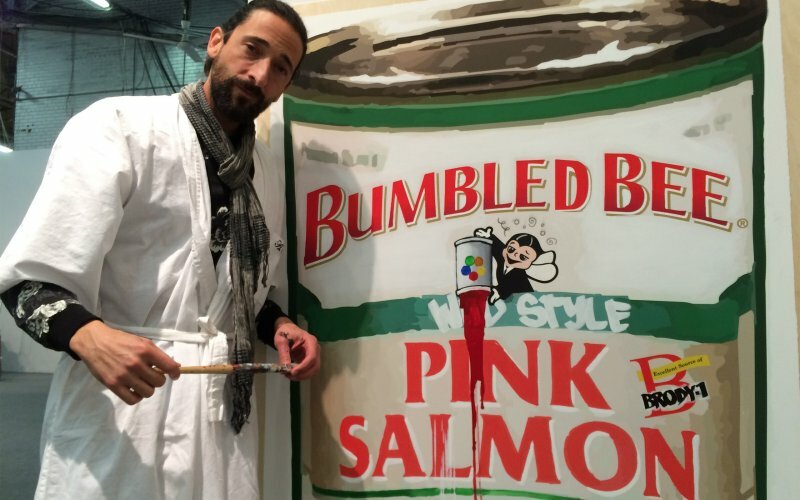 Friends encouraged him to pick up the brush again, particularly the artist Domingo Zapata, who has guided Brody, taught him techniques, and showed work with him at last winter’s Art Basel Miami Beach. “The autonomy I gain from being a painter or from doing anything creative that I can put my hands on and do is the freedom no acting can bring,” Brody says emphatically. “These are my creations, not my interpretations of somebody else’s interpretation, as dictated and directed to me. “Bumbled” is another word on the can, meaning “high on power, and how the corporations end up leaving the world in shambles.” Wild Alaska has become “Wild alas canned” to show how the bucolically pastoral images on canned foods can be far from the actual conditions animals are kept in. But as grim as his words are, he swims off to meet his public happily enough. He starts laughing, talking, and appears an equable center of attention. He is wielding his paintbrush as a conductor would a baton. It’s going to be a fun, intense few days for Adrien Brody.